Hello! 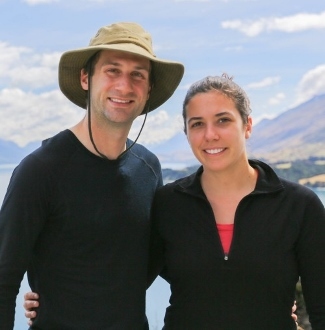 We are Jordan and Jenna – an adventurous Canadian couple who love being active and sharing our adventures with others! Our journey started in September 2013 when we quit our jobs, sold our houses, cars and belongings in Canada – packed our bags and moved to the other side of the world! Looking for adventure, while still pursuing our careers, we set off for New Zealand to experience ‘Living a Kiwi Life’. We lived in Wellington for 2.5 years and one of the biggest lessons we’ve learned since moving to New Zealand is to appreciate our free time and take advantage of the opportunity to get out and explore. We spent the previous 3 years back in Canada working full time and taking our MBA part time and we slipped into the perception that there just wasn’t enough time for all the fun things in life. When we moved to New Zealand we had no obligations, no excuses to hang on to and we were exposed to one of the most beautiful (and adventurous) countries in the world! We spent the first 6 weeks exploring the North and South Island before settling into our jobs and life in the beach side suburb of Lyall Bay. As we continue to pursue our careers we take advantage of every spare moment to get outdoors and do something fun! We maximize our evenings, weekends and holidays to get out and explore, whether we’re climbing a mountain, surfing or pushing our limits with an adrenaline filled activity. Now back in Canada, we are excited to explore our own backyard with a renewed appreciation! 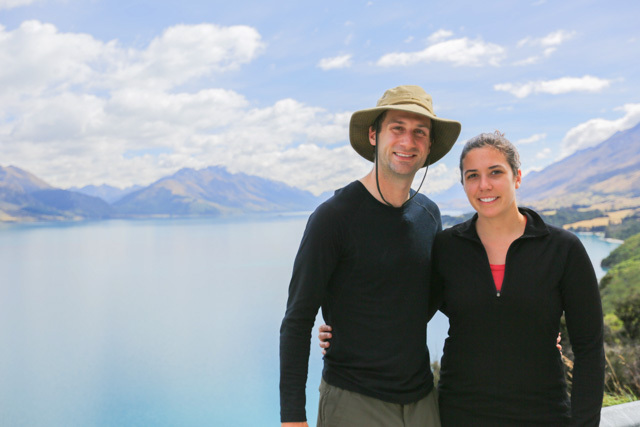 Watch our ‘Living a Kiwi Life’ web series to see how our journey started! Guys I’m discovering your blog and I am FAN !!! I can’t believe I found your blog by accident with so nice content. I have my own blog too with all the experience of an immigrant in Canada (too bad it is in portuguese) and I have a list of blogs that I follow and one of them actually refereed to a post you guys posted and when I saw you in the picture, OMG. 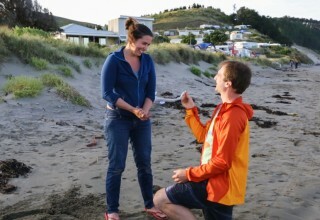 Very nice to see that you are settled in NZ and enjoying. I have watched many of your videos on youtube and afterwards I knew I’ll make Work&Travel in NZ after finishing school next year. Nice inspiration. Thank you. Thanks Finn glad you enjoyed our videos! Good luck! I think you went to school with my kids, Heather, Ian and Christine…not sure. But I know your Dad coached Christine’s soccer team for a while. My friend, Susan Martin and I (both retired teachers from P.C.) will be in NZ from Feb 27-Mar 25. We are pretty excited! I just went through a lot of your blog and videos…very impressive! And helpful! Following along for awhile and I keep coming back. Love the content and the adventure you’re living…. keep it up 🙂 p.s Hello from a fellow Kiwi living expat! Thanks for the feedback, glad you’re enjoying our adventures!! Where are you based in New Zealand? Awesome site and videos and you guys are very lucky to have each other, especially Jordan, most women just want to settle down with a mortgage, a mini-van and lots of kids. Thanks Jake, yah she’s a keeper! Your pictures and videos are excellent, very inspirational. I can’t believe how much you have been able to do in such a short period of time. You must have laid down some serious cash for this adventure, so worth it! Thanks Jeff! Since moving to NZ we really have tried to maximize our free time 🙂 And we have learned to prioritize adventures and travel over ‘stuff’ so we do use any spare cash to fund adventures! As I always wanted to visit NZ, you both are great inspiration for me and my fiancee to follow our own dreams and live to the fullest. Thanks so much for the lovely note Egidijus & Kristina! So happy you’ve been enjoying our videos and hope your dreams do come true! 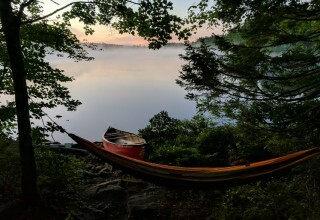 I just found you guys and love your story and your site! My partner and I are heading to NZ this fall for a few months and your site has been SO helpful for us not only for planning but also in keeping us excited for what’s a head. All the best to you guys as you continue to live the dream! Thanks so much Tia and Jason! 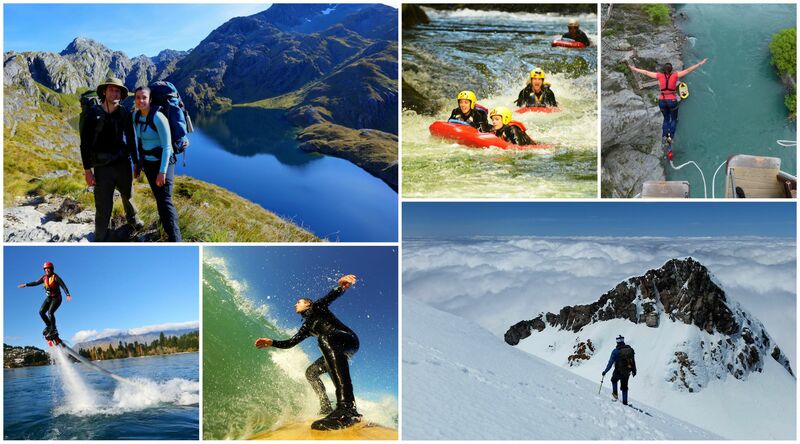 So happy you’ve found our site helpful and that it gets you even more excited for New Zealand! All the best in your adventure! Such a cool webpage. We just love it!!! We will travel to NZ in 55 days for our first time and we are really excited after checking out all your posts! Thank so much. Regards from Switzerland! Thanks Corry & Mike! Glad you’ve been enjoying out website and hope you have a great time in New Zealand! Awesome. I am looking forward to the WHV of the NZ in the next few years. I watched the Ultimate Road Trip from YouTube and got the website. Hope I can meet you in the NZ one day. I’ve just discovered you yesterday and have watched all 50 of your videos and read all your “Moving to NZ blogs”. You’ve helped clear up so many questions I’ve had! I’m departing from Nova Scotia (Hey Jenna, I’m actually a fellow Pictou County gal from Trenton!) in 31 days to start my adventure in New Zealand. You guys are awesome please continue creating content! So happy to hear you’ve enjoyed our videos and blogs – amazing you’ve watched them all already! Wish you all the best on your adventure to New Zealand! It’s a bit late to be emailing but there’s still a few hours until New Zealand hopefully wins the Rugby World Cup! I’m a kiwi and live in Wellington too. A couple of months ago on a gloomy winters day I needed cheering-up and searched for the Routeburn Track on YouTube. Your video popped up and I quickly became a fan. 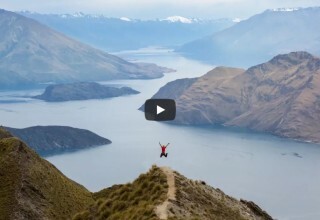 I’ve walked the Routeburn Track a couple of times and your video reminds me why I went back. I’ve seen it in pouring rain and clear blue skies. I will never forget the feeling of exhilaration as I crested Harris Saddle and saw that amazing view. The views from the top of Conical Hill weren’t bad either! That video makes me want to go back so badly! I think I’ve worked my way through most of your videos now. You’ve really developed a special talent there. Award-winning in fact! Congratulations on your very recent New Zealand Geographic Photography Award for your glow-worms time-lapse video! You deserved to win. I’ve traveled and tramped all over New Zealand and absolutely love the beauty and diversity of this place. Many kiwis take what we have for granted. Your videos and kind words make me appreciate even more what a beautiful country this is and how lucky I am to live here. Thanks to both of you. I don’t know why Tourism New Zealand don’t have you on the payroll! 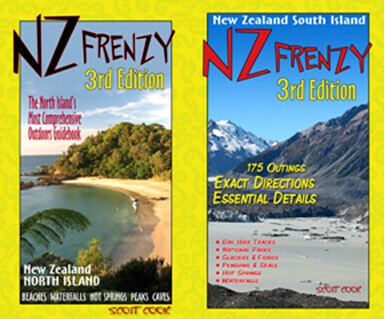 As for Tourism NZ – we’ve been working on it but it’s not easy! I know this is a little late now but…..welcome to your new home!! 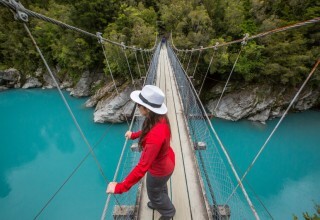 I’m just discovering your blog and I love seeing NZ through new eyes. Your content is beautifully put together and showcases our amazing country from a unique perspective. Congratulations on your award winning glow worm video, that was just gorgeous! Thank you for sharing your adventures with us, you are a long way from home but I hope you view NZ as your new home, you both look like you fit right in! Thank you so much for the lovely note Jasmyn! I reach here accidentally but i am in love with this blog now. Actually, i am also trying to migrate to Canada or NZ. I haven’t decided it yet. I know Canada is very nice country and as well as NZ. But to migrate, sounds like NZ is easier than Canada. However,i have heard that NZ has racism issue to Asian. Is it correct? If you were not Canadian, where will you choose to live among Canada and NZ? I want to hear more about comparison of Canada and NZ if you have time. you guys rock! I’m super inspired. Hey there. If you could live anywhere in New Zealand (I work for myself so I can). Where would you chose as the best access to all the good outdoors? Any tips appreciated. I would say Wanaka. It’s surrounded by beautiful mountains, chill town and much less touristy than some others. Lucky to have that option! Why did you decide to leave New Zealand and come back to Canada? 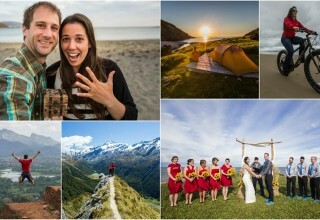 I stumbled across your videos and blog looking for ideas for our trip to NZ next year. All are just amazing! Cool style and technique you have….short but telling the story perfectly. Anyhoo… I wondered if you had done any “behind the scenes” videos to explain what goes into filming one your videos? You must always be running to catch up like I am! lol. Yes we have a blog and a full behind the scenes video on how we make our travel videos 🙂 Hope you enjoy! Great site and great videos! How do you guys do the map trick in Ep2 of Living a Kiwi Life? Hello! Great website – I’m just starting to take a full look around. My husband and I are thinking about moving to NZ at the start of 2018 on a working holiday visa. We’re both Canadian citizens, currently living in England but we both grew up in Canada. We want to do something different and take full advantage of our opportunities in life. Your website and videos look fantastic and I can’t wait to keep exploring the website – it’s very inspiring. Thank you! Glad you’ve enjoyed our blog! Best of luck on your own NZ adventure! Hopefully you two are coming back. You’ve provided a great insight into what we have outdoors. Beautifully produced and fun to watch. Well done!